We have already made exciting advances to date, with the ability to print biological materials and cells with unprecedented resolution and fidelity. Put simply, we can do more than print something that looks cool—we can 3D print tissues that actually work. What is the Bioengineered Organs Initiative/How does your research tie into the Initiative's mission? The Bioengineered Organs Initiative (BOI) is an exciting new multidisciplinary effort by the College of Engineering at Carnegie Mellon University (CMU) to address the massive shortage in organs donated for transplantation by developing a new generation of bioengineered organs that can serve as long-term replacement therapy. The College of Engineering has invested >1$M into the BOI as seed funding and brought together faculty from across the University with expertise in bioengineering, biology, chemistry, materials science, computational modeling, and manufacturing. While CMU does not have a medical school, we do have a unique collaborative culture and research into the bleeding edge of biomedical technology. What we are doing is developing advanced technologies that enable us to seamlessly integrate biological and synthetic materials together into hybrid devices that combine the best attributes of both. For example, we are using vascular endothelial cells to line the surface of a bioartificial lung to prevent clotting, and combining this with an advanced 3D bioprinter that can print the supporting collagen scaffold for cell attachment together with the plastic housing required for the whole device. My lab ties into the BOI by developing these next-generation 3D bioprinting technologies. We have already made exciting advances to date, with the ability to print biological materials and cells with unprecedented resolution and fidelity. Put simply, we can do more than print something that looks cool—we can 3D print tissues that actually work. What is your lab doing that's novel? How will your research drive the need for innovation in the next generation of functional, 3-D bioprinted tissues and organs? The novelty of our research is based on the technique we developed, termed Freeform Reversible Embedding of Suspended Hydrogels (FRESH) 3D bioprinting. First published in 2015 in the journal Science Advances, FRESH 3D bioprinting is designed specifically to enable the 3D printing of soft and living materials, something that has been challenging to date. Specifically, FRESH works by 3D printing inside of a support gel that can be melted away after the printing is completed. The support gel enables incredibly soft materials to be 3D printed with ease and maintained in 3D space until the printing is completed. The 3D printing is performed at room temperature, and the melting is performed at body temperature, so everything is done within the narrow temperature range required for living cells to remain viable. With FRESH, we can print a wide range of cell types and biological materials, including collagen and other extracellular matrix proteins that make up most tissue in the human body. In terms of function, that is exactly what we are working to demonstrate right now in the lab. Specifically, we have been able to 3D bioprint functional heart valves that can support physiologic pressures and contractile human heart muscle in complex 3D shapes. We are currently refining this work for publication. 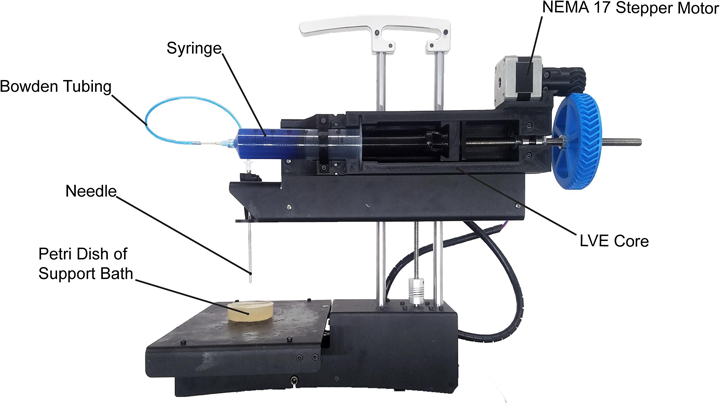 You recently published a paper that releases open-source designs for 3-D printing your own bioprinter. How is this breakthrough significant? What is different about this bioprinter from existing bioprinters on the market? We are big proponents of open-source hardware and software in our research. When I started my research lab in 2010, we wanted to develop bioprinting technology, but commercial bioprinters cost >$200,000, which is just a ridiculous price for a new professor. So instead, my lab bought an early open-source based MakerBot and modified this into a 3D bioprinter by replacing the plastic extruder with a custom-designed syringe extruder. This worked amazingly well, and over the past 6 years we have continued to refine the design and improve the performance of the system. Because we built our 3D bioprinter using open source hardware and software as the underlying platform, we decided we should release our modifications back to the open source community. Led by former PhD student Dr. TJ Hinton, we started releasing our hardware designs in 2015. The recent paper in HardwareX is the evolution of this process, where we released designs, step-by-step instructions and detailed videos on how to build a version of the 3D bioprinter we use in our lab. This now enables anyone in the world to replicate what we have done. In fact, we have received emails from people in Europe, Africa, Asia, and South America that are now building these printers. The impact is truly global. Importantly, the 3D bioprinter is incredibly low cost, costing ~$50 to modify an existing desktop 3D printer, or <$500 to buy everything and build it. For most research applications our design performs as well or better than commercial 3D bioprinters, which currently cost anywhere from $5k to >$200k. Can you give us a quick rundown of how the printer works and what kind of tissue it can reproduce? Our 3D bioprinter is pretty straightforward. We basically use a syringe as the print head, and then extrude materials out of the syringe. When used in combination with our FRESH 3D bioprinting approach, this enables printing of complex tissues and organ scaffolds composed of collagen, cells, and other biological components. Currently, my lab is focused primarily on 3D bioprinting functional components of the heart, working to build heart valves, heart muscle, and other cardiac tissues where disease often leads to heart failure. However, the power of 3D bioprinting is the flexibility of the platform to fabricate nearly anything you can design. This is why we collaborate with >10 other research labs pursuing a range of applications including muscle tissue, bone and cartilage, vascularization strategies, and stem cell therapies. This is also why we have worked to share our open source design with the broader research community, so the impact of our work can be amplified by enabling scientists and engineers globally to build on what we have done. Of course, it’s not just scientists and engineers, because the low cost and open source bioprinter is really something anyone—from college students, to kids in grade school, to entrepreneurs in their garages—can build and use. Who will benefit from the technologies your lab develops? My lab’s mission is focused on developing new technologies to build functional tissues and organs, with the majority of the work focused on the heart and the eye. We see this work as benefiting everyone, as heart disease is the leading cause of death worldwide and the only treatment for end stage heart failure is a heart transplant. However, currently heart transplants only address 1% of the people who could benefit from them because donor organs are severely limited. More broadly, by developing technologies that are low cost and accessible, we hope that other researchers will apply our technologies to other diseases and medical needs, and some of that is already happening. How far away is the technology from being used in the real world and what steps are needed to get it there? Our technology is already entering the real world as a research tool in 3D bioprinting. We are also launching a startup company to commercialize our FRESH 3D bioprinting technology so that it is an industrial scale process that can be used by medical device companies to start printing living tissues and organs. For the bigger question of when a 3D bioprinted tissue or organ will be available to patients in need, that is a harder question to answer. My estimate is that it will be 15 years before these technologies become clinically viable, with significant work in collaboration with the FDA required to move these technologies into patients while ensuring they have the performance a reliability required. But I believe it is no longer a question of if this will happen, just a question of when. Like many things, the more resources focused on this, the faster it will happen. Are there any other exciting projects in the works that you would like to talk about? 3D bioprinting is just one of many ways we are engineering tissue and organs. In the eye, we have developed another technique using protein nanofabrics to rebuild the human cornea to restore vision. This project works closely with faculty in the Department of Ophthalmology at the University of Pittsburgh and is funded by the NIH.